Boston Red Sox outfielder Mookie Betts runs onto the field at the start of the game against the New York Mets at Fenway Park in Boston, Massachusetts, on Saturday, September 15, 2018. “Big League Brian” entertains a crowd gathering on Jersey Street before the game against Chicago White Sox at Fenway Park in Boston, Massachusetts on Friday, June 8, 2018. English Mastiffs Odin and Thor pose for a photo before game one of the ALCS versus Houston Astros at Fenway Park in Boston, Massachusetts, on Saturday, October 13, 2018. Boston Red Sox outfielder Andrew Benintendi throws from the outfield during the game against the New York Yankees at Fenway Park in Boston, Massachusetts, on Friday, September 28, 2018. Boston Red Sox infielder Brock Holt collides with Fenway’s fabled Green Monster during the game against the New York Yankees at Fenway Park in Boston, Massachusetts, on Sunday, September 30, 2018. Boston Red Sox outfielder Mookie Betts rounds first base after hitting a grand slam during the game against the Toronto Blue Jays in Boston, Massachusetts on Thursday, July 12, 2018. The home run came after a 13-pitch at-bat. Boston Red Sox outfielder Mookie Betts receives a Gatorade shower after hitting a home run to end the game in the 10th inning during the game against the Minnesota Twins at Fenway Park in Boston, Massachusetts on Friday, July 27, 2018. Fenway Park as viewed from the top of the Green Monster during the game against Seattle in Boston, Massachusetts on Sunday, June 24, 2018. Fans converse over Fenway Franks during the game against the Atlanta Braves at Fenway Park in Boston, Massachusetts on Saturday, May 26, 2018. A fan wearing a Red Sox jersey with several signatures watches batting practice before the game against the Texas Rangers at Fenway Park in Boston, Massachusetts on Monday, July 9, 2018. Boston Red Sox outfielder Mookie Betts reacts after hitting a walk-off home run during the game against the Minnesota Twins at Fenway Park in Boston, Massachusetts on Friday, July 27, 2018. Boston Red Sox outfielder Brock Holt and catcher Christian Vasquez high-five outfielder Andrew Benintendi during the game against New York Mets at Fenway Park in Boston, Massachusetts, on Sunday, September 16, 2018. A fan hugs a servicewoman who was honored during Fenway’s Hats Off to Heroes ceremony in the fourth inning of the game against the Chicago White Sox in Boston, Massachusetts on Friday, June 8, 2018. Fans watch from underneath Fenway’s iconic Coca Cola sign in Boston, Massachusetts on Friday, July 6, 2018. Boston Red Sox outfielder Brock Holt rounds second base during the game against the Cleveland Indians at Fenway Park in Boston, Massachusetts on Thursday, August 23, 2018. Boston Red Sox shortstop Xander Bogaerts during the game against the Texas Rangers in Boston, Massachusetts on Wednesday, July 11, 2018. Boston Red Sox outfielder Mookie Betts looks to catch the ball in right field during Game 1 of the ALDS against the New York Yankees at Fenway Park in Boston, Massachusetts, on Friday, October 5, 2018. The Boston Red Sox swarm catcher Blake Swihart after he made a hit that ended the thirteen-inning game against the Philadelphia Phillies at Fenway Park in Boston, Massachusetts on Monday, July 30, 2018. The Boston Red Sox are the first team to earn 100 wins, defeating the Toronto Blue Jays 1-0 at Fenway Park in Boston, Massachusetts Wednesday, September 12, 2018. This was their first 100-win season since 1946. Boston Red Sox pitcher David Price pitches during the game against the Cleveland Indians at Fenway Park in Boston, Massachusetts on Thursday, August 23, 2018. Boston Red Sox pitcher Nathan Eovaldi pitches during the game against New York Yankees at Fenway Park in Boston, Massachusetts on Saturday, August 4, 2018. Boston Red Sox outfielder Mookie Betts makes a catch in the outfield during the game against the Seattle Mariners at Fenway Park in Boston, Massachusetts on Sunday, June 24, 2018. 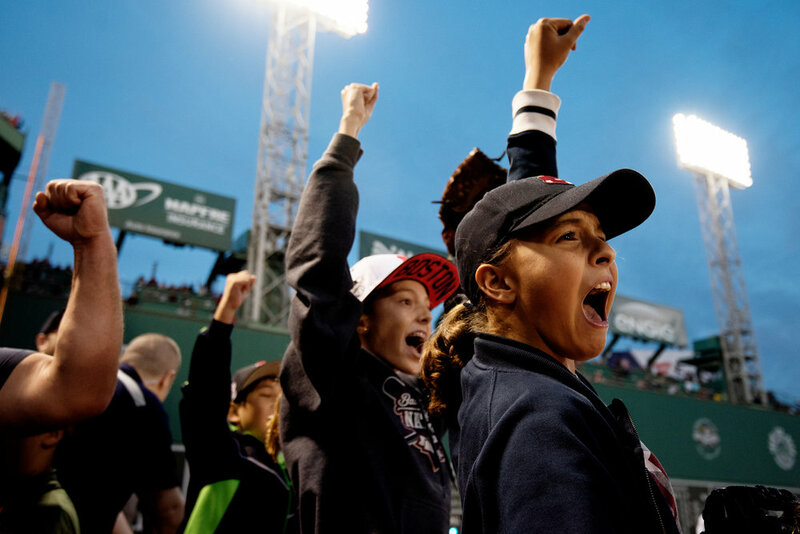 Fans react after the Red Sox's final win of the season over the New York Yankees at Fenway Park in Boston, Massachusetts, on Sunday, September 30, 2018. Boston Red Sox third basemen Rafael Devers runs to third base during the game against the New York Mets at Fenway Park in Boston, Massachusetts, on Saturday, September 15, 2018. A view of Fenway Park before Game 1 of the World Series versus Los Angeles Dodgers in Boston, Massachusetts, on Tuesday, October 23, 2018. Boston Red Sox second basemen Eduardo Nunez reacts as he rounds the bases after pinch hitting a 3-run home run during Game 1 of the World Series versus Los Angeles Dodgers at Fenway Park in Boston, Massachusetts, on Tuesday, October 23, 2018. Members of the Boston Red Sox react after the final out was recorded to win the 2018 World Series in game five against the Los Angeles Dodgers at Dodger Stadium on Sunday, October 28, 2018. Boston Red Sox second baseman Ian Kinsler hoists the trophy over his head after winning Game 5 of the World Series versus Los Angeles Dodgers at Dodger Stadium on Sunday, October 28, 2018.